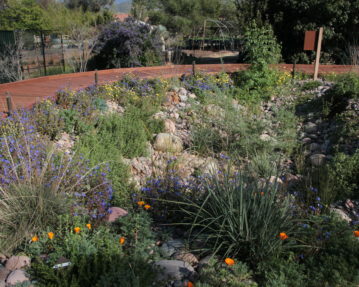 The Water Conservation Garden is composed of a series of demonstration garden spaces that showcase drought-tolerant plants from around the world and the many different garden styles possible with this expansive plant palette. 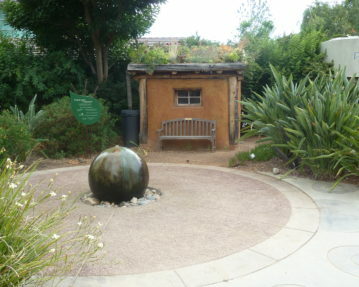 All aspects of water-smart gardening for the Southern California region are covered in our exhibits. Plants from the xeric eco-regions of the world are represented including California, South Africa, Australia, Chile, and the Mediterranean. Water-efficient gardening tips and techniques are demonstrated throughout our 6-acre campus. 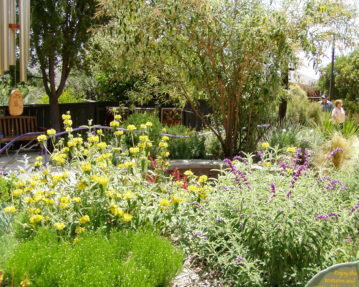 Detailed water-wise gardening protocols are provided in our Landscape & Garden Resources page. Come by and check us out! 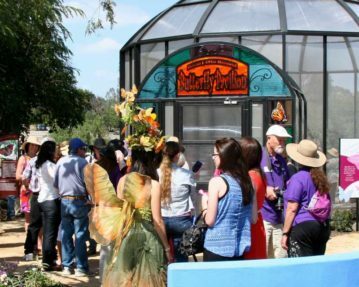 The Dorcas E. Utter Memorial Butterfly Pavilion is a glass and steel structure inspired by Victorian era conservatories, and features colorful butterflies native to Southern California and the beautiful drought-tolerant nectar flowers that support them. 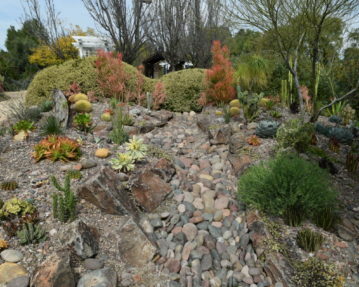 Our award-winning succulent garden, designed by succulent plant master Michael Buckner, is a naturalistic environment that features drought-tolerant succulents and cacti from around the world. This ecological garden demonstrates a straightforward approach to habitat creation called plant community design. By replicating plant associations found in nature, a low-maintenance and exceptionally drought-tolerant landscape is produced. 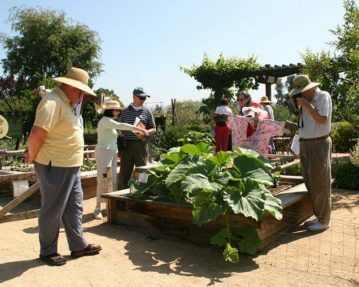 Our vegetable garden space is filled with great ideas for San Diego home gardeners, including innovative techniques for improving soil, minimizing water and optimizing irrigation efficiency. 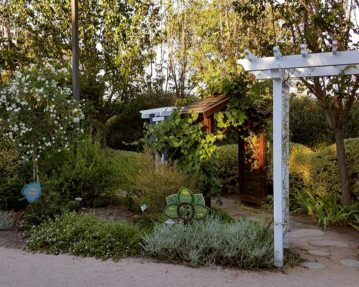 The White Garden is a demonstration of a beautiful garden design that emphasizes the color white in draping vines, soft flowing perennials, and spring bulbs and annuals. 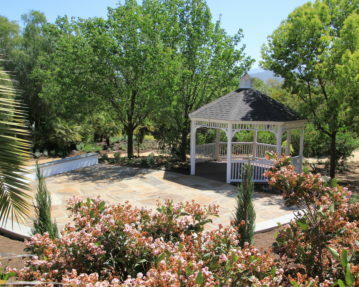 The beautiful Gazebo lies at the heart of the Water Conservation Garden, surrounded by lovely trees and roses. It’s a perfect locale for a garden wedding, and an example of a targeted irrigation approach. Mulch is one of the critical factors in creating drought tolerance in the landscape, along with use of drought- tolerant plants, and efficient irrigation. 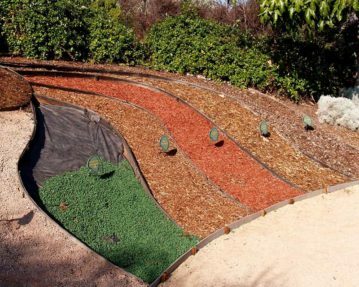 Our mulch exhibit shows the great variety of mulches available that are useful in San Diego gardens. 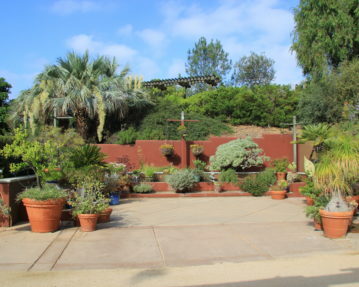 The Dorcas E. Utter Sensory Garden is a Mediterranean, perennial herb garden featuring plants with sensory qualities such as scent and a soft touch. 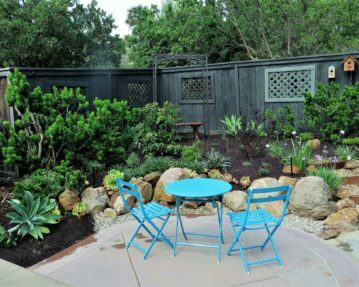 The Backyard Makeover exhibit demonstrates a lawn alternative surrounded by blooming drought-tolerant shrubs against a tall fescue lawn in the same square footage. Our Container Patio exhibit showcases container design techniques and drought-tolerant plants that grow well in containers. 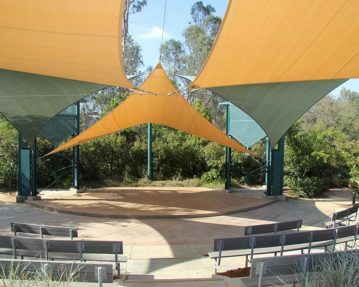 The Water Conservation Garden’s outdoor Amphitheater holds several hundred guests and is surrounded by a display of drought-tolerant pine trees from around the world. 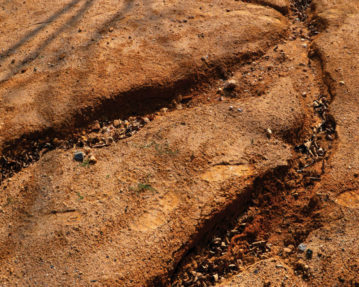 Considering how little rain falls in Southern California, you’d think erosion wouldn’t be a problem here. Grass is greedy. Few plants demand more water. 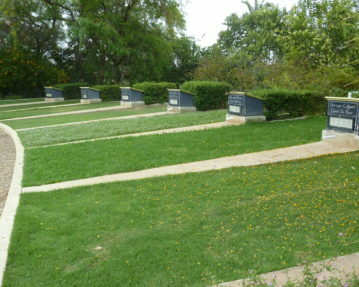 Yet almost any xeriscape can include a small lawn if you choose your turf wisely. Permeable pavement allows storm water to infiltrate through the soil below it.